Heritage is a great source of inspiration for contemporary design and digital tools are now the easiest way to reach inspiration resources. Thus, Createx project makes available a selection of textile heritage from the territories which are partner of the project in order to give useful resources to young designers. 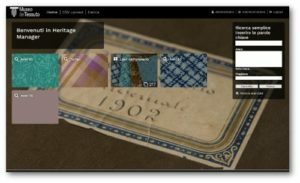 A digital asset management called Heritage Manager, developed in the framework of Creativewear project, provides detailed information and photographic resources about this heritage. A simple and an advanced research filters the informations to address the research at best. The database presents a selection of textile and fashion heritage from the territories which are partners of Createx project. HOW CAN A DESIGNER ACCESS THE DATABASE?